Everyone looks back on the year on December 31, I bet. For us, it’s been a year with a lot of ups and downs. The economy dropped our number of boarders by about twenty percent. Hay was out of sight. Yet we managed to get the hay we needed, and we’re back almost to full capacity. I walked around the place for the last time in 2011 this morning, and, as usual, found plenty to look at. 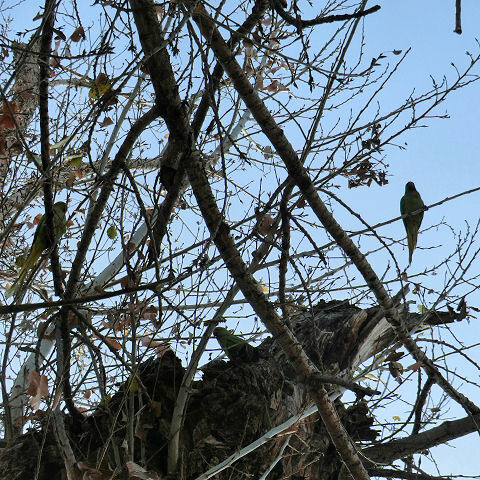 There was a flock of rose-ringed parakeets scolding me from the branches . . . I wonder if they’re really breeding in the wild? Xena, as usual, accompanied me. 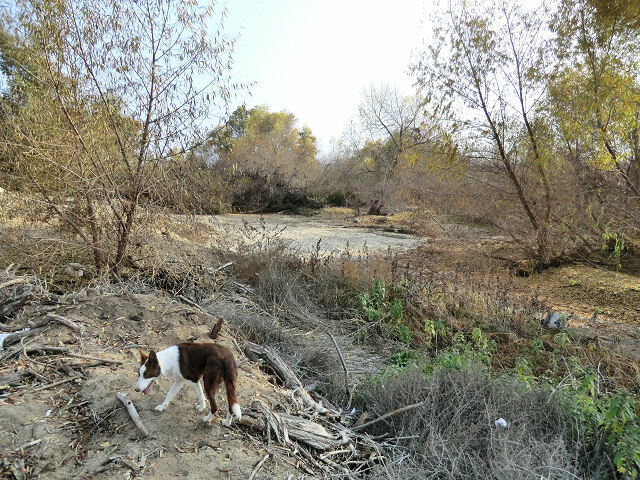 We looked at the sandy riverbed, where cool water flowed all summer. I wonder if there’ll be water there next summer? It’s sure been dry . . . I stopped to look at some of the horses. Paints are very popular right now, and some of them have really wild markings. This one, for example . . .
Then I looked back and saw that good old Cider was following gamely, so I strolled back to the house. She loves to come on these walks, but she sure slows them down. You can’t begrudge her the companionship, but I’ll sneak out later for a little faster walk. It’s been a pretty good year! Yesterday was Bella’s turn to get some attention. I took the camera out, fully intending to document her ground driving session, then forgot all about it until we were done and unharnessing. Here she is, wondering what the holdup is. This spring, I was unhappy that she had rubbed out her beautiful mane. It’s growing back, but it’s still easy to see the part that’s shorter. I thought about evening it up, then decided it would be interesting to see how long it took to grow back entirely. If she doesn’t rub it out again, that is. She and Kody are such different personalities. She’s ladylike and Delicate; he’s mischievous and seems to have a sense of humor. That’s half the fun of working with animals; watching their personalities emerge. They’re both great fun, though! Well, that was the way I felt at the library this afternoon. I was at the end of a longish line, waiting to check out, when a man got in line behind me. He had bad breath . . . really bad breath. Between the onions and the alcohol fumes, my eyes actually watered every time he exhaled. And he was a mouth breather, of course. I thought I’d never get up to the counter. And the worst part was that the gentleman in front of me kept glancing over his shoulder . . . and I’m sure he thought it was me! One last thing . 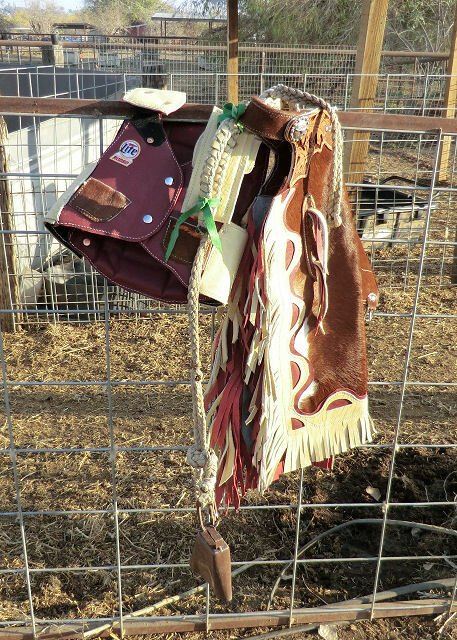 . . I’ve been meaning to post this picture of little Alex’s “bull riding” outfit all together, taken just before it left for his house; chinks, vest, and little bull rope, complete with cowbell. Those are going to be some surprised sheep. Last night was interesting. Billy had gone on his ten o’clock rounds — usually, but not always, the last time he checks all 270-odd horses. I was curled up cozily watching TV when I heard him honking outside. That always means trouble, and yep, there was a problem. He had found two horses out running around, and needed help catching them. So I stuffed my feet into my shoes, grabbed a jacket and a halter, and headed out. He said he had been almost at the end of his round when he spotted them — and they were headed toward the road. So he got around them in the pickup, and spooked them back toward the pens. Then he tried to raise our other helpers, but they were either gone or sleeping like the dead. So he came after me. 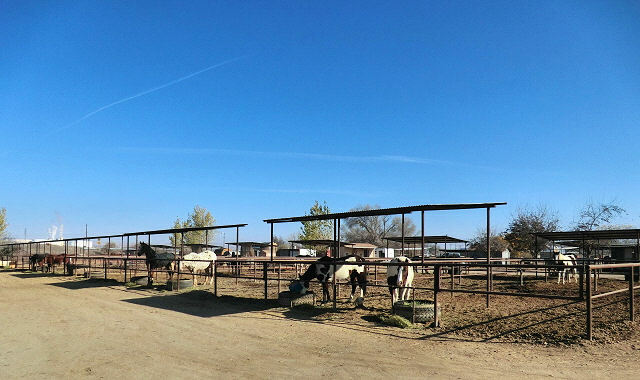 We found them visiting with some of the other horses, and luckily they were very near an empty pen. I hopped out and caught one easily; he was a friendly soul. I led him into the pen, the second horse followed and hesitated at the gate, Billy waved his arms, and in he went. We shut the gate, took a deep breath, and really looked at them for the first time. We scratched our heads for a few seconds, wondering where they had come from — and hoping someone had not just abandoned them. That’s been happening in some places. 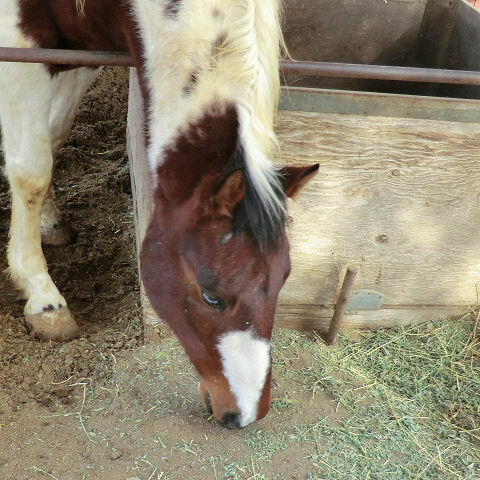 However, they were fat, blanketed, and gentle; not the kind of horses that get dumped. So we double-tied the gate and went home. The next morning, they were claimed right away. They were from a neighboring stable, and the owner had forgotten to chain their gate. So there was a happy ending — but this just shows how important it is at a stable to have someone who not only is around, but actively watching the horses. If those horses had strayed up to the main road, there might have been quite a different outcome. But Billy’s really good at what he does. As for me — somewhere along the way I stepped in a pile of dog poop, and didn’t smell it until I was back in my chair. Sigh . . . that’s the way it goes. It was warm enough yesterday to get Kody up and wash his tail. Since it’s a white tail, it requires washing more often than Bella’s. Neither one of us was very enthusiastic — it wasn’t that warm. But we got it done. Today, we harnessed up and rattled around the place, practicing keeping a regular tempo at the trot, and making smooth turns. It went very well. Kody is such a good boy — usually. When is he a bad boy? When you tie him up to the rail and he promptly starts cribbing on it. Now, if you don’t know what cribbing is, it’s an unpleasant habit that some horses and ponies have. Usually, it’s one that has been kept up in a stall with nothing much to do. 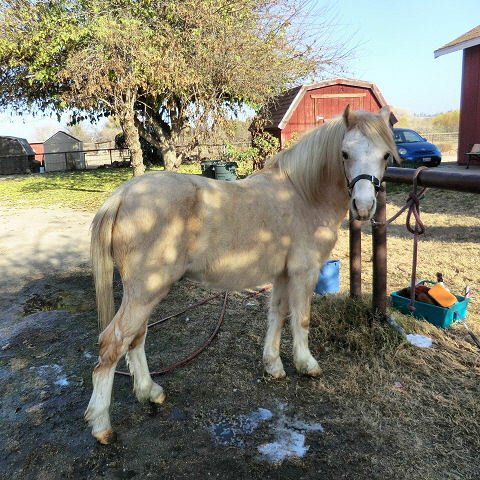 Since Kody was a little stallion for much of his life, that’s probably when it got started. It detracts from their value, which is part of the reason that I got him comparatively cheap. But what is it? Well, they take hold of something with their teeth, arch their necks, and gulp air. It makes a horrible belching noise, and when it’s something metal they grab, it also makes a screech like nails on a blackboard. That’s the sound of their teeth wearing down. Here’s Kody caught in the act. 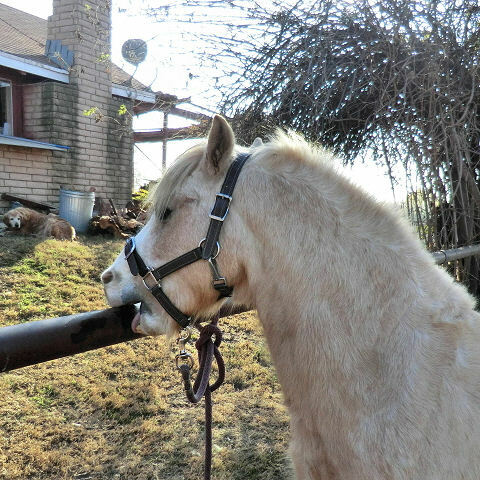 In addition to wearing down their front teeth, cribbing can sometimes cause colic; and some get so obsessed with it that they neglect their food to rush over and grab a rail. It’s a very bad habit. What do they get out of it? Apparently it causes a rush of endorphins to the brain. In other words — they’re addicts. Luckily, Kody is not too heavily into windsucking, another name for the same vice. Cribbing, by the way, is a worn-down version of crib-biting; and crib is an old word for a manger. So when the carol goes, “Away in a manger, no crib for a bed” — it’s not exactly accurate. Anyway, Kody’s a cribber; but his good points more than make up for it.
. . . and a beautiful, if cold, day. I went for a walk this morning, and stopped to record some of the horses enjoying their Christmas breakfast under a brilliant blue sky. I sat on the lowered tailgate of the pickup and led her behind it. She led beautifully, putting up no fuss even going under the bridge. 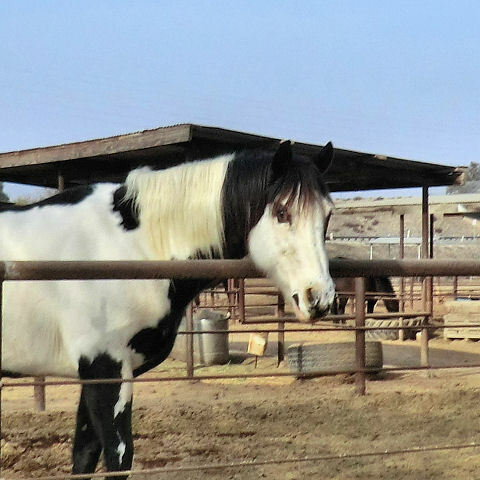 We got to the sick pen, Billy went in to check his medications — and the old girl pulled away from me and headed back to her pen at full gallop. We hopped back into the pickup and followed her. Our helper Jerry had caught her before we got there. Since she was wild-eyed and excited, we decided it would be best for Jerry to lead her while I walked back. I was almost home when here she came, thundering down the road toward me at a dead run, having pulled away from Jerry in just the same way. I began waving my arms and flapping my jacket, trying to look scary enough to get her stopped. 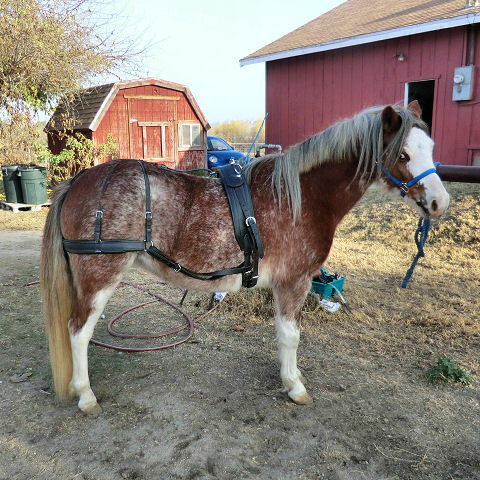 She stopped — but no sooner did I grab the lead rope than she ripped it out of my hands and bolted for home. Again. At that point, we decided that a) she couldn’t be too sick if she could run like that, and b) we could probably keep an eye on her while she was in her much-loved pen. As of last report, she was fine. Exercise is good for a belly-ache — so she ought to be good for quite a while. 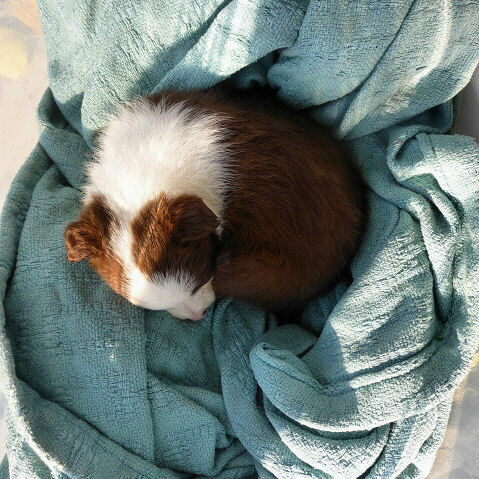 We certainly hope so — doctoring her would be quite an adventure.
. . . that a whole year has gone by since Xena was a little ball of fur like this. Now she’s a grown-up lady, trotting importantly around the ranch and keeping an Eye on Things. I didn’t write about the interesting experience I had day before yesterday in the garage. I had gone out to do a load of wash. I had a load of dark clothing that had been accumulating a day or two, so I would have enough for a load. I started picking them up and sticking them in the washer. I picked up one of Billy’s shirts and gave it a shake — and Something flew out of it, landed on the garage floor with a thud and a squeak, and bolted for the sliding door. It hit that with another thud and squeal, and headed for the hills. It was a full-grown rat. It had thought it had found a really cozy home . . . I stood there blinking for a moment, and then continued putting the clothes in the washer, resolving to run them through twice. It wasn’t until later, relaxing in the recliner, that I realized I probably should have had screaming hysterics. It never occurred to me; in fact, thinking about it, I don’t remember ever screaming about anything in the last forty years. It’s just not useful. But I’m just as happy that I didn’t actually pick him up — or get him in the washer. And, no doubt, so is the rat.